HortResearch SA has developed a number of physical products which are unique and have been rigorously tested. 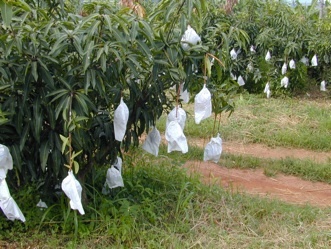 Fruit bags or sleeves to non-chemically prevent disease, and solar, wind, and pest injury. Spray on inert coatings to prevent fungal and bacterial disease infection. Coatings to reduced moisture loss and prevent the occurrence of mould on litchis during extended transit storage.